Tips for the Alien hive game. Learn how to evolve a supreme alien being with no money down. 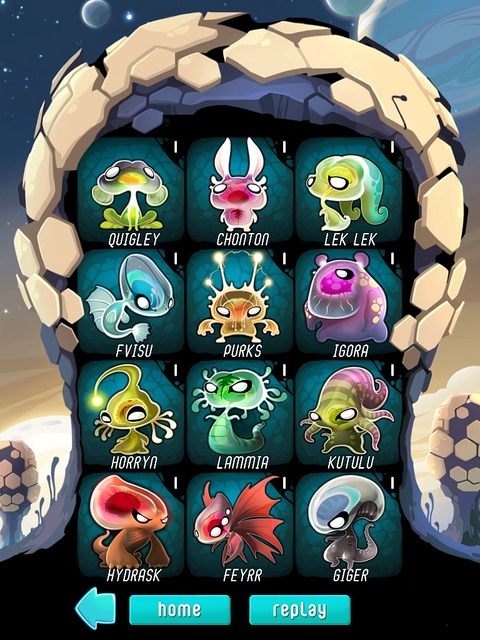 Have you played Alien Hive and got frustrated? 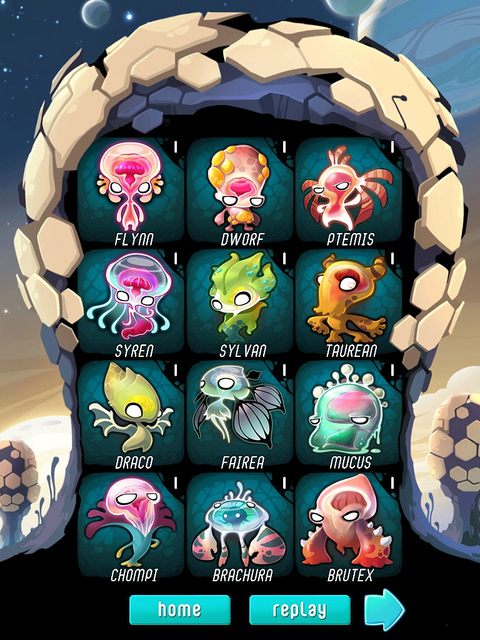 The aim of the game is to evolve a Supreme Alien. But the problem is that you run out of moves before you can evolve a supreme alien being. No matter how you try, you just couldn’t do it. I have figured out a way to evolve a supreme alien being without having to purchase any additional gold or power-ups with real money. I’ve tested and perfected my strategy. It works and here is the proof. Screenshots of my hive with all 24 supreme beings evolved. My strategy is not the only way to evolve the aliens but I find that it is fail-proof. It might become a spoiler for you. Therefore, think before you carry on reading (^_^). First, you will need to know how to use the power items available to your advantage. The picture below shows you all the power items and what they are for. 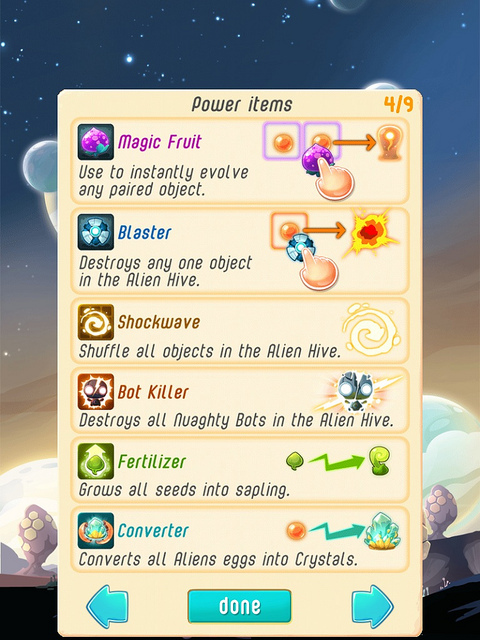 The Magic Fruit, Converter and Bot Killer are the most useful, especially the Magic Fruit. It is crucial to my strategy. Secondly, you cannot evolve a supreme being in one single game. You need to play at least 4 games depending on how good you are at the game. The goal for the first few games is to accumulate magic fruits. Do not use your magic fruits at all until you have accumulated at least 12. If you are still trying to evolve your first alien, I suggest you accumulate more than 12. 16 perhaps, in case you are running out of energy (moves) and need to evolve lower level aliens. The natural way to evolve aliens is to match 3 aliens of the same level. Evolving 3 alien eggs into a baby alien isn’t that hard but this game is designed in a way that there are almost always insufficient energy/moves to reach a supreme being in a single game. Many players have complained that all they could usually reach is the alien cocoon. The magic fruit allows you to take a short-cut. Evolve a higher level alien with a pair of lower level aliens instead of three. It saves you the energy/moves needed to evolve the 3rd alien. You can, of course, buy the magic fruits but they aren’t cheap; 3000 gold. And the whole point is to not use real money to play this game. Therefore, create and accumulate magic fruits by playing more games instead. You create magic fruits by matching plants. See the first part of the picture below. Start playing with the intention of matching plants. Don’t waste your moves on evolving aliens at this point. 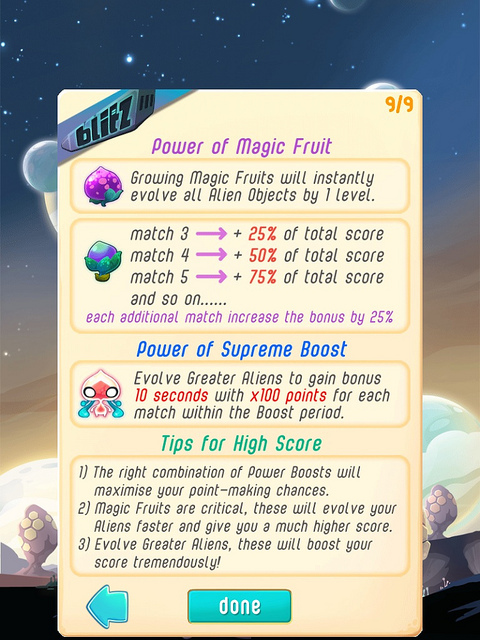 Focus on making and accumulating magic fruits by matching plants. Try to make as many as possible in each game. If you are really good at the game (see tips and tricks below), you can perhaps make 3 or 4 per game. When you have enough magic fruits (12 or more), you can start the final evolution game. The first move of your evolution game is to apply the converter. 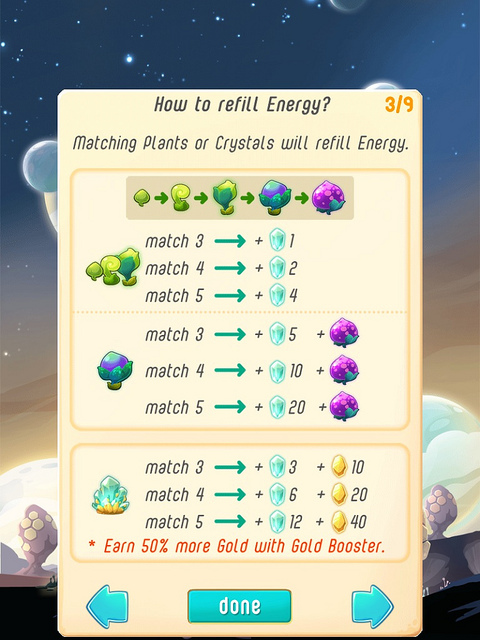 The converter (see the last box in the picture above) converts all alien eggs into crystals. All matched crystals will merge to give you additional moves. If you are lucky, you may end up with 150 to 200 moves. Try to match the alien eggs until you get 2 alien babies to line up side by side. Apply a magic fruit to the pair to evolve them into a higher level alien. Continue to do this until you have your second pair and apply the magic fruit again. I hope you get where I am heading with this. Every time a pair of same level alien is lined up, apply the magic fruit. Do not waste moves evolving too many same level aliens. Evolve enough to allow you to move up to the next level until you get your supreme being. I hope you try this out and don’t give up if your first attempt fails. My first attempt fell short of just one more match. I ran out of magic fruits. I started from scratch again and accumulated more fruits and eventually evolve my first supreme alien. Do not just focus on the area surrounding the empty slot. When you move the tiles, do not just move one or two, move the entire row or a sizeable portion of the row. Even if you can’t see what may happen, it actually helps. I also find moving the tiles horizontally more helpful than vertically. Multiple matches seem to happen more frequently when I do that. 2. What to do with the naughty bots? Naughty bots block your moves by freezing the items next to them. Blast them with the bot killer. If you can “endure” until there are 4 to 5 bots on your board, your bot killer will be very efficient. However, if you find that you are wasting many moves trying to get around them, then just use the bot killer. Saving your moves are more important than saving your bot killers or blasters.